Lukas didn't have what it takes to be a racehorse. He didn't show too much enthusiasm for dressage, either. But that hasn't stopped him kicking on to become the brainiac of the horse world. Lukas demonstrates his spelling ability. With a reputation as the world's smartest horse, Lukas now receives more than 100 emails a day. Lukas, now 17, is living proof that horses can have a life beyond the racetrack, even if it means following more cerebral pursuits. His transformation from a down and out thoroughbred to a celebrity horse is thanks to the efforts of Southern California owner Karen Murdock. Lukas raced under the name Just Ask Mike. He left the track as a two-year-old with two bowed tendons after three unmemorable race finishes. He changed hands several times and ended up emaciated and neglected in a back yard. 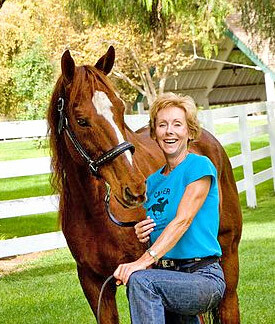 He was rescued by a neighbor, Sue Smith, who took pity on the then eight-year-old chestnut gelding. "You could see every rib and his tail was a solid bat of dried mud," she recalls. Smith, a local trainer, had hoped to eventually include him in her amateur jumping programme. After two years, however, he still wasn't fitting in, according to Smith, and Murdock purchased him after seeing his picture ad in the local Horsetrader publication. 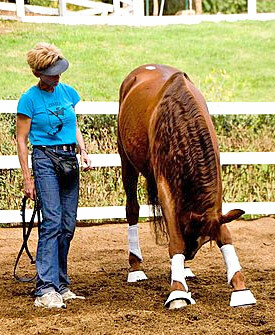 "Working full-time as a psychiatric nurse, I had our (then) barn trainer begin some basic lessons on him, with the plan to take over myself and show him at lower level dressage shows. "In a very short time Lukas became sullen and resistant to the point of being extremely dangerous - bucking, bolting and spooking (even in his own stall!)." Several well-meaning observers suggested it was time to stop persevering with Lukas. She agreed that after 30 years of training horses, she had just about met her match with Lukas. "Before giving up, I decided to fall back on my many years of behavioural-training experience ... and also try to find out what he would enjoy doing. Lukas has a large repertoire of tricks. More pictures are on his home page. Murdock used several techniques, including a specialised version of clicker training, as well as lots of positive reinforcement. "I set about un-training, by replacing unwanted behaviors with desirable responses. "The particular responses that I chose to substitute happened to be tricks - fun and play being at the core of my system. I've always used the trick training games as a way to create a connection and build confidence, willingness, focus and trust." Lukas responded to the training, laced with patience, kindness, affection and appreciation. To date, his repertoire includes smiling, posing, nodding yes and shaking his head no, a dry and wet kiss, fetching, being "blindfolded", catching, yawning, saluting, pedestal work, a Spanish Walk (forward and backward), the stay and come, jambet (a three-legged pivot), curtsy, passage, bow, crossing his front legs, laying down while Karen sits on him, feet together (front and back), hide and seek (with his beloved green towel), acting lame, pushing a cart, and the rear. Most of his acclaim, however, comes from his spelling, counting, identifying shapes and discriminating colours. 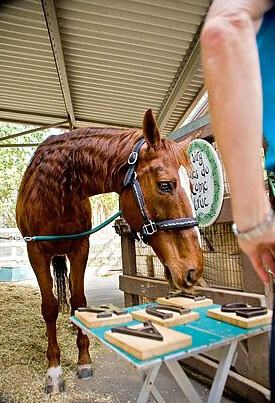 His clever equine exploits have seen him feature on NBC, CBS, ABC, CNN, and other media outlets around the world. "His journey - which has really become a message of hope and happiness - has been in countless magazines, newsletters, blogs and newspapers world-wide," Murdock says. "Our bond has attracted global attention as far away as New Zealand, and Lukas has over 5000 Facebook friends in almost every country. "Lukas is listed on Yahoo, Google and the World Record Academy as 'The World's Smartest Horse' and Guinness is considering a record on him. "All to show the happy results of gentle training and how wonderful and intelligent animals are. "Children, especially, are part of Lukas' mission - his appearances are geared toward including families with an emphasis on responsible pet ownership. "He is the official Spokeshorse for TROTT (Training Racehorses Off The Track) and a poster-boy for the California Thoroughbred Breeders' Association," she says. "Horse rescues across the country have claimed him as their shining example and he's even been invited to Washington to lobby for legislation by the Humane Society. "Many equine-assisted therapy groups have befriended him and he's associated with HEAL (Human-Equine Alliances for Learning) - a practice to assist trauma victims." His proceeds and services are donated to help others, Murdock says. He even has a book available on Lulu, as an e-book or in print, entitled "Playing With Lukas." Aside from his appearances, his caregivers are busy responding to the more than 100 emails Lukas gets every day, many thanking the 16.2 hand for the inspiration he provided them. "Now, if only I could teach him to answer his own mail!"